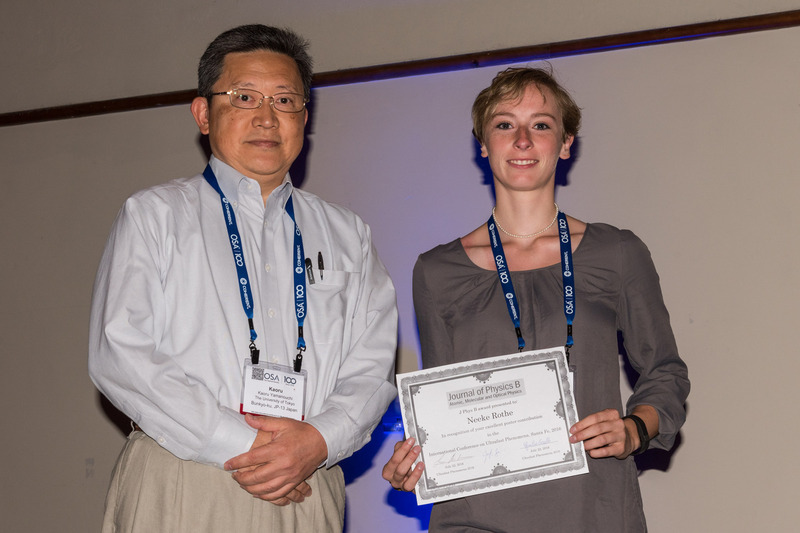 JPhysB was delighted to be one of the corporate contributors to the recent International Conference of Ultrafast Phenomena held in Santa Fe (NM) from 17-22 July 2016. 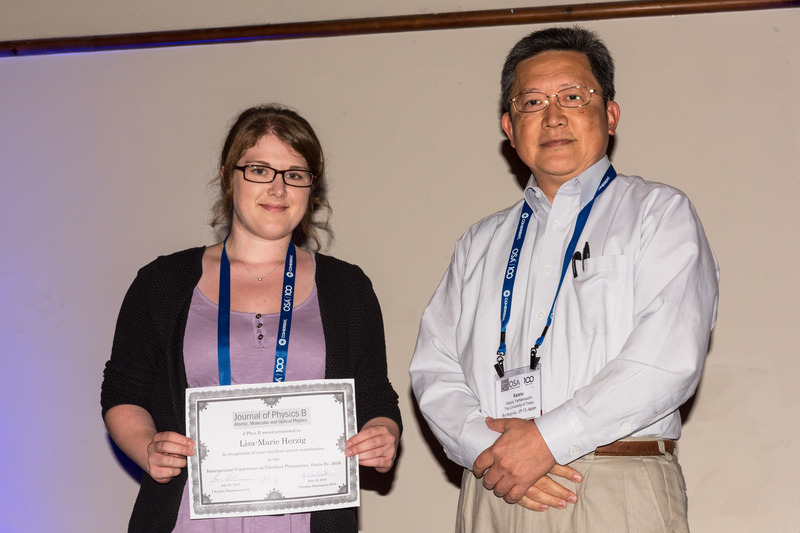 As a result of this support, two poster prizes were awarded by conference organizers/members of the Jury: Louis DiMauro (OSU), Giulio Cerullo (Politecnico di Milano) and Jennifer Ogilvie (University of Michigan). We would like to congratulate Lisa-Marie Herzig, currently studying for a PhD in photo-uncaging dynamics at the Goethe-Universität Frankfurt, and Neeke Rothe, PhD student in the Dynamics of Molecular Systems group of the University of Rostock for winning these prizes. Professor Kaoru Yamanouchi (Tokyo University), who was himself conference chair of the previous Ultrafast Phenomena conference held 2 years ago in Okinawa, kindly agreed to announce the names of the winners on behalf of the journal, in his capacity as member of the JPhysB Editorial Board, during the last morning sessions. Herzig responds: “In a caged compound the biologically activity is temporarily switched off, but can be switched on again by a light induced release of a free biomolecule. Therefore, caged compounds allow the photoinduced regulation of biochemical processes with a high spatiotemporal resolution. In my PhD project I investigate the photodynamics of the caged antibiotic puromycin. The light triggered release of puromycin offers the possibility to observe protein folding or to monitor local protein expression in neurons. Hence, we investigate the uncaging mechanism with a combination of ultrafast pump/probe techniques and steady-state measurements. Rothe explains: “The aim of my PhD project is to study the time evolution of dense laser plasmas generated by intense ultrashort laser pulses. For this purpose a pump-probe setup was developed featuring sub-50 fs pulses. Coherent diffractive imaging is used as probing process, thereby we achieve a high spatial resolution. This is essential since the plasma dynamics varies across the Gaussian shaped excitation focus. At the conference Ultrafast Phenomena 2016 the setup for our approach, which is similar to in-line-holography and first results for a laser plasma from a 30 nm thick gold foil were presented. Furthermore it was shown, that the spatially and time resolved complex transmittance of the sample can be reconstructed by a phase retrieval algorithm. We would like to congratulate once again both winners for their outstanding contribution at the conference. Professor Franz Kärtner (CFEL, DESY & MIT) agreed to chair the next meeting, which will take place in Hamburg in two years’ time.